the traditional Irish hand drum. and within minutes the whole bar is playing along to traditional Irish music. so get there early to get a good seat and enjoy. Just have a look at some of our videos on the facebook feed to the right of the page to see for yourself. 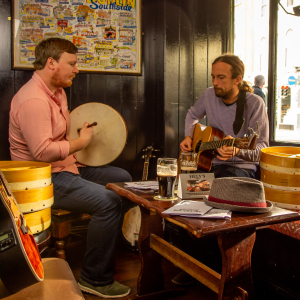 The bodhrán session is also available for private group booking so click here to get in touch if you would like to arrange a bodhrán session for your group.